“Pope Francis told the farmers present in the Clementine Hall that there is no humanity without the cultivation of the earth, as there is also no life without good food that is produced for men and women of every continent,” Vatican Radio reports. Rome -- Pope Francis has ratified the elections of prelates from bishops' conferences around the world to participate in October's global meeting of Catholic bishops, confirming selections of 48 prelates from six continents. Among the number are four U.S. prelates: Louisville, Ky., Archbishop Joseph Kurtz; Philadelphia Archbishop Charles Chaput; Galveston-Houston Cardinal Daniel DiNardo; and Los Angeles Archbishop José Gómez. The papal confirmations, announced in the Vatican's daily press bulletin Saturday, mean the prelates will be able to participate and vote in the discussions of next October's meeting, known as a Synod of Bishops. The Synod, which is focused on issues of family life and has attracted hopes that the church might alter some of its pastoral practices in that area, is the second of two called by Francis for 2014 and 2015. The 2015 synod is to be held Oct. 4-25 at the Vatican on the theme: "The Vocation and Mission of the Family in the Church and Contemporary World." It follows the 2014 synod, held on the theme: "Pastoral Challenges of the Family in the Context of Evangelization." The earlier synod, known as an extraordinary synod, mainly involved the presidents of the world's bishops' conferences. The upcoming synod, known as an ordinary synod, is to be much larger, involving the elected representatives from each of the bishops' conferences. The names confirmed Saturday as ratified by the pope for participation in next October's synod do not comprise a final list of prelates who will participate in the synod, as the pope has yet to confirm elections of members from many other countries. The pope is also expected to name a number of prelate-members at his own initiative. (Vatican Radio) The Permanent ******* Mission of the Holy See to the United Nations on Friday told the UN Security Council spoke about the dangers posed to innocent civilians, especially women and girls, in armed conflicts. “In conflict settings women and girls are more vulnerable as a result of inequality and are directly targeted as part of fear tactics and deliberate assaults on their rights,” said the statement, read by the Chargé d'Affaires of the Mission, Msgr. Janusz Urbańczyk. (Vatican Radio) The Vatican Tribunal opened its 86th session on Saturday morning. At the Mass to mark the occasion, Vatican Secretary of State Cardinal Pietro Parolin said the application of the law must be both rigorous and compassionate. But its application must also be free of vengeance and of popular notions of justice, he told the judges and members of the Vatican Tribunal. Following the Mass, the Tribunal’s Promoter for Justice, Gian Piero Milano, gave his opening address for the new judicial year. He spoke of the disturbing increase in the case law of financial crime and corruption. This is “a veritable plague," which affects an inviolable right of the individual to his human dignity, he said. 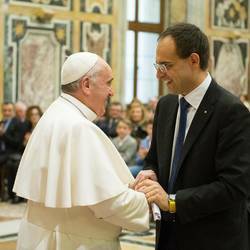 He spoke of the process of reform launched by Benedict XVI and intensified by Pope Francis citing, for example, the establishment of the Council and of the Secretariat for the Economy. He also referred to the Motu Proprio of July 2013, which punishes certain crimes committed against the security, fundamental interests or assets of the Holy See and creates significant changes for the Vatican Tribunals. Regarding crimes against minors, the promoter said there are ongoing investigation measures being put in place, including an initiative related to crimes against children committed abroad by a public official of the Holy See, including those with diplomatic duties and archbishops. This initiative is assumed to activate tools of international judicial cooperation, he said. Regarding the prevention and fight against money laundering, the promoter noted that a Motu Proprio in August two years ago introduced “strict requirements” on cross-border transportation of cash. As a result, he said, checks were performed on more than 4,000 people and 7,000 vehicles entering and leaving the Vatican in the past year. With the globalization of crime, the Promoter said the Vatican Tribunal has experienced an increase in international cooperation, with 10 requests for legal assistance from foreign countries, of which eight were from Italy. The Promoter said there has also been a call for the introduction of specific provisions for the crime of usury, which is not currently in the code of law. Milano concluded his address by stating there were six arrests in the past year. Pope Francis has felicitated Italy’s new president, Sergio Mattarella, who was elected the 12th head of ‎the Italian state on Saturday. A constitutional court judge and veteran centre-left politician, Mattarella ‎was elected with a broad majority at the fourth ballot on the third day of voting this week. In a ‎telegbram to the 73-year old president-elect the Pope said that while wishing that he be able to carry out ‎his noble duty, especially in the service of the unity and harmony of the nation, he was invoking on him ‎constant Divine help for an enlightened action in the promotion of the common good, in keeping with ‎the authentic human and spiritual values of the Italian people. Here is the translation of the Holy Father's address before and after the recitation of the Angelus today to the faithful gathered in St. Peter's Square. This Sunday's Gospel reading (cfr Mk. 1, 21-28) presents Jesus, who, with his little community of disciples, enters Capernaum, the city where Peter lived and which in that time was the biggest city of Galilee. And he entered the city. Mark the Evangelist tells us that Jesus, being that day the Sabbath, went quickly to the synagogue and He began to teach (cfr v.21). This makes us think of the primacy of the Word of God, a word to listen, to receive and to announce. Vatican City, Feb 1, 2015 / 04:11 am (CNA/EWTN News).- During his Sunday Angelus address Pope Francis announced he will visit the Bosnian capital of Sarajevo in June, where WWI broke out in 1914 with the assassination of Austrian Archduke Franz Ferdinand. “Dear brothers and sisters, I would like to announce that Saturday, June 6, God willing, I will go to Sarajevo, capital of Bosnia and Herzegovina,” the Pope told pilgrims gathered in St. Peter’s Square Feb. 1. As part of his trip Pope Francis will be visiting the local Catholic community, but will also be entering a nation marked with vast ethnic and religious diversity, which served as a key factor in the country's recent war. “I extend my appreciation to the associations, movements and all those who defend human life,” Francis said. The Pope said that by opening ourselves to life and serving life, “we experience the revolutionary power of love and tenderness, inaugurating a new humanism: the humanism of solidarity, a humanism of life,” he said. (Vatican Radio) Pope Francis delivered the homily on Monday afternoon at Mass in St. Peter's Basilica, being celebrated to mark the feast of the Presentation of the Lord and the World Day for Consecrated Life, in the context of the Year dedicated to the same. Below, please find Vatican Radio's English translation of the Holy Father's prepared remarks. Before our eyes we can picture Mother Mary as she walks, carrying the Baby Jesus in her arms. She brings him to the Temple; she presents him to the people; she brings him to meet his people. The arms of Mother Mary are like the “ladder” on which the Son of God comes down to us, the ladder of God’s condescension. This is what we heard in the first reading, from the Letter to the Hebrews: Christ became “like his brothers and sisters in every respect, so that he might be a merciful and faithful high priest” (Heb 2:17). This is the twofold path taken by Jesus: he descended, he became like us, in order then to ascend with us to the Father, making us like himself. (Vatican Radio) Lithuania’s clergy have been “heroic” in defending the Church in times of persecution – that’s what Pope Francis told Bishops from the Baltic nation who are in Rome for their ad Limina visit. If Lithuania was for many years “oppressed by regimes founded on ideologies contrary to human dignity and freedom,” the former Soviet state is now faced with “other dangers such as secularism and relativism,” the Pope said in a written statement. The last Soviet troops left Lithuania on 31 August 1993 and the country became a full member of the European Union in 2004. Lithuania adopted the euro as its official currency on 1 January 2015. In his remarks to Lithuanian bishops meeting in the Vatican Monday, Pope Francis noted some of them had lived through the “sad times” of persecution and observed the Church’s pastors have historically accompanied the faithful spiritually, through material difficulties, and in the construction of society. (Vatican Radio) Pope Francis approved a series of episcopal appointments on Monday for Tanzania, Ireland and Mexico. The Holy Father appointed Bishop of the Diocese of Shinyanga, Tanzania, Msgr. Liberatus Sangu, Official of the Congregation for the Evangelization of Peoples. Bishop-elect Sangu, of the clergy of Sumbawanga, was born February 19, 1963 at Mwazye, Diocese of Sumbawanga. After his primary and secondary education in local schools, he studied philosophy at the Major Seminary of Our Lady of Angels Kibosho, in the Diocese of Moshi, and theology at the Major Inter-diocesan Seminary St. Charles Lwanga Segerea, in the Archdiocese of Dar-es-Salaam. He was ordained to the priesthood on July 9, 1994. 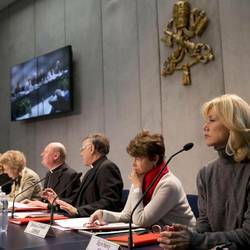 Cardinal Gianfranco Ravasi’s Pontifical Council for Culture has dedicated its upcoming Plenary Assembly to “Women's cultures: equality and difference”. The assembly, which will be taking place between 4 and 7 February, was presented at a press conference in the Vatican today. The themes listed in the preparatory document include: aggression against women, the role of women in the Church and plastic surgery as a “burka made of flesh”. A promotional video clip featuring Italian actress Nancy Brilli who is the face of the event, attracted both praise and criticism in the English-speaking world. “The expression “women’s cultures” does not imply any division from men’s cultures, but shows our awareness that there is a women’s “perspective” on the world and all that surrounds us, on life and on experience,” the “outline document” for the plenary assembly - published on the Vatican dicastery’s website www.cultura.va – reads. The text was “composed by a group of women in the light of pastoral considerations sent in by [the] Members and Consultors” of the Pontifical Council. The document presents four themes: “Between equality and difference: the quest for an equilibrium”, “‘Generativity’ as a symbolic code”, “The female body: between culture and biology” (in this section the text mentions the issue of domestic violence, plastic surgery as a “burqa made of flesh” and how to avoid a purely functional approach to women and their bodies (seductive, metrification, marketing)?) and “Women and religion: flight or new forms of participation in the life of the Church?” (“What spaces are proposed to women in the life of the Church?”). The Pontifical Council headed by Ravasi will introduce the Plenary Assembly at Teatro Argentina in Rome, on 4 February at 3.30 pm. More names of members/substitutes will be announced at a later date. Also, Bishop Blase Cupich became the Archbishop of Chicago on November, 2014. (Reuters) - A Russian newspaper critical of President Vladimir Putin is among the nominations for the 2015 Nobel Peace Prize, along with Edward Snowden, Pope Francis and a priest helping African migrants. Although the committee has marked the last four 10-year anniversaries of the 1945 bombing of Hiroshima by honoring the fight against nuclear proliferation, there was little speculation among Nobel watchers that the trend would continue. Thousands of people, including all members of parliaments, can make nominations, which must be postmarked no later than Feb. 1. The $1.2 million award will be announced in October. The Norwegian Nobel Institute does not publish names of nominees, but Norwegian experts compile lists. Pope Francis has been nominated for stressing social justice and care for the environment, and former U.S. spy agency contractor Edward Snowden, who leaked details of U.S. electronic surveillance, for showing how citizens are monitored with few democratic controls. Kristian Berg Harpviken, head of the Peace Research Institute, Oslo, named as his favorite Mussie Zerai, a priest of Eritrean origin living in Italy who has helped some of the thousands of African migrants who have risked their lives to cross the Mediterranean. (Vatican Radio) Daily contemplation of the Gospel helps us to have true hope, said Pope Francis Tuesday morning during Mass celebrated in the Casa Santa Marta chapel. In his homily, the Pope again urged people to take 10 minutes out of their day to pick up the Gospel and talk to the Lord, rather than waste it on TV soap operas or listening to other peoples’ gossip. Focusing on the passage from the Letter to the Hebrews on hope, Pope Francis said that “keeping our gaze fixed on Jesus” is the core of hope. He stressed that if we do not listen to the Lord, we may be “optimistic or positive” people but without the hope that we learn “from contemplating Christ”. He said: "'How do I contemplate with today’s Gospel? I see that Jesus was in the middle of the people, he was surrounded by a large crowd. Five times this passage uses the word 'crowd'. Did Jesus ever rest? This would lead me to think: 'Always with the crowd ...'. Most of Jesus’ life was on the streets, with the crowd. Did he ever rest? Yes, once, says the Gospel, he was sleeping on the boat but the storm came and the disciples woke him. Jesus was constantly in the midst of the people. And this is how we look at Jesus, contemplate Jesus, imagine Jesus. And so I tell Jesus what comes to my mind to tell him". The Congregation for the Causes of Saints announced that Pope Francis has recognized the martyrdom of Archbishop Oscar Romero of San Salvador. Archbishop Romero was assassinated on March 24th, 1980, while celebrating Mass at a local chapel. The Salvadoran prelate was an outspoken voice against the Revolutionary Government Junta and their persecution of the Catholic Church and repression of basic human rights. His cause for canonization began in 1990 and was formally accepted by John Paul II in 1997, when the martyred archbishop was given the title "Servant of God." Although Romero's cause passed a theological audit by the Congregation of the Doctrine for the Faith in 2005, the process was slowed down due to the death of John Paul II. Following Benedict XVI's election, several liturgical changes to the Congregation of the Causes of Saints further delayed the cause. During his return flight from South Korea in August 2015, Pope Francis explained to journalists that the Salvadoran archbishop's cause was initially blocked "for prudence". "What I would like is to have clarified when there is martyrdom in ‘odium fidei’ (out of hatred for the faith), whether it is for confessing the credo or for performing the works that Jesus commands us to do for our neighbor," the Pope said. "For me, Romero is a man of God. He was a man of God but there has to be the process, and the Lord will have to give his sign (of approval). But if He wishes, He will do so! The postulators must move now because there are no impediments." (Vatican Radio) Have the courage to look into the darkness and light a lamp against human trafficking. That’s what men and women of goodwill across the world are being asked to do this Sunday, Febuary 8th, International Day of Prayer and Awareness against human trafficking. The initiative, presented on Tuesday morning in the Vatican, and promoted by the International Union of Superiors General in collaboration with the Pontifical Councils of Pastoral Care, of Migrants and Itinerant People, of Justice and Peace as well as the Congregation for Institutes of Consecrated Life and Societies of Apostolic Life, has gathered force also thanks to Pope Francis’ seal of approval. Describing the trafficking of persons as a crime against humanity, and urging all to join forces to free the victims and stop this increasingly aggressive crime, Pope Francis has given extra momentum to the work done by “Talitha Kum”: an amazing, world-wide network of women religious who are committed to fighting the battle against this new form of slavery. But they cannot continue to do so alone. So the International Day, which symbolically falls on the Feast day of freed Sudanese slave Saint Josephine Bakhita, is an invitation to all to take heed and commit, in some way, to fight one of the worst examples of slavery of the XXIst century. Official statistics estimate roughly 21 million poor and vulnerable people are victims of trafficking for sexual exploitation, forced labour, begging, organ trafficking, domestic servitude, forced marriages, illegal adoption and other forms of exploitation. (Vatican Radio) Pope Francis has encouraged fathers to be a daily example of love and integrity for their children. Addressing the pilgrims gathered in the Paul VI Hall for the weekly General Audience, the Pope continued his catechesis on the family, reflecting in particular on the dignity and role of fathers. Referring to the Book of Proverbs which speaks of the joy and pride which fathers feel as they see their children mature in wisdom and rectitude , the Pope said these words sum up the demanding but indispensable role of fathers in the family and in society as a whole. Here is the translation of the Holy Father's address during his weekly General Audience at the Paul VI Audience Hall. Today I would like to develop the second part of the reflection on the figure of the father in the family. Last time I spoke of the danger of “absent” fathers. Today, instead, I want to look at the positive aspect. Saint Joseph was also tempted to leave Mary, when he discovered that she was pregnant, but the Angel of the Lord intervened and revealed God’s plan and his mission of foster father. And Joseph, a just man, “took his wife” (Mt. 1:24) and became the father of the Family of Nazareth. Every family needs a father. Today we reflect on the value of his role, and I would like to begin from some expressions that are found in the Book of Proverbs, words that a father addresses to his son: “My son, if your heart is wise, my heart too will be glad. My soul will rejoice when your lips speak what is right” (Proverbs 23:15-16). Vatican City, Feb 4, 2015 / 07:07 am (CNA/EWTN News).- As the number of deaths in Ukraine continue to rise amid escalating violence, Pope Francis has called the war “a scandal,” and urged the international community to “make every effort” for peace. Once again my thought goes to the beloved Ukranian people. Unfortunately, the situation is worsening and the opposition between the sides is getting graver. We pray, first of all, for the victims, among whom there are many civilians, and for their families, and we pray to the Lord that this horrible fratricidal violence will end soon. I renew my heartbroken appeal that every effort be made – also at the international level – for the resumption of dialogue, the only possible way to bring about peace and harmony in that martyred land. Brothers and sisters, when I hear the words "victory" or "defeat", I feel a great pain, a great sadness in my heart. They are not the right words. The only right word is peace! This is the only right word! I think of you, brothers and sisters of Ukraine. But think about this, this is a war among Christians! You have your Baptism, you are fighting among Christians! Think about this, this scandal! And let us pray so that prayer may be our protest in front of God in times of war. While expressing criticism for the Ukrainian Greek Catholic Church's stance in the conflict between Russian-backed rebels and Ukraine, Patriarch Kirill of Moscow and All Russia praised the Vatican's "balanced approach toward the Ukrainian crisis." Interfax news service reported that the Patriarch of the Russian Orthodox Church said that policies pursued by the Ukrainian Greek Catholic Church "are causing concern in our relations with the Roman Catholic Church. Patriarch Kirill stated that the Ukrainian Greek Catholic Church "pushed for the overthrow of the authorities using nationalistic and often 'Russophopic' slogans as its cover." However, the Orthodox Patriarch of Moscow and All Russia praised the Holy See's stance for a halt to the conflict and appealing for peace on both sides. "I would like to note with satisfaction that the Holy See itself has always pursued a balanced stance toward the situation in Ukraine and has avoided any lop-sided assessments, but has called for peace talks and an end to armed clashes," he said.